Yelloweaver is a blog by Jocelyn Moon. We arrived in the Northwest in late September. En route I became re-acquainted with the redwood groves, whose bright sun patches shift about on the windshield while driving on those terrible curves. You tried to text someone for too long, the 3G signal as ragged as the sunlight, and the conversation dragged on. It warped your inner ear to move so much between time zones and I had to pull over for 10 mins while you vomited on the grass. I drove the whole way, exhausted by such long stretches of highway and unable to talk to you sleeping there. The corridor of evergreen conjured vague memories of travelling up the coast, of music festivals and long lines for nachos. I'm sure those recollections are mixed with dreams and I can't tell if that little novelty shop and its worn wooden handrails are something real or imagined. For three days we don't stop for cows. Not a single heifer in the road. The herds are fenced in their pastures, content with such lush banks of green. There are no indecisive fowl lingering on the roadsides that freak and aim straight for our tires as you curse and dodge. No goats, either. Or enormous snakes that blaze across the pavement to clear the way before we pass. Now the only cow on the road is my little moon-mobile that cranks up the hills, pedal full on as the other cars sail past, the blacktop a smooth and silent wake. My corolla may be old, but it has all the luxuries. Iced latte in the cup holder (it's yours, but I drank it). AC. Talk radio. Windows that function. After some hours, and especially when the signal fades, I find I might be slightly bored. Or bored for sure. We haven't picked up a passenger once. The weather is good. No one at Starbucks wants to talk to me. Batteries charged, we are GPS'd from SoCal to Seattle under bright and glowing sign posts. This last road trip is mundane & I think I know the details when we get there. The small ones, that is, the tools that conjure memories. I am not sitting in my American dream house playing nocturnes on a Steinway. I'm in a basement far from town trying to recall the name of that river we couldn't cross. I dig into the pile of 35 cent happy animal journals from Longcheng Plaza and attempt to decipher my script. It is mid-May '17 and we wake up early in Mutoko, right when the birds start in. We are at the Nyaruwabvu homestead with Kudakwashe, picking lemons and tangerines before breakfast. He tells us that green naartjies taste better and in some of the orange fruits we discover a sultry worm coddling her eggs. Let's stick to the green, then. It is harvest time and the day before the three of us conducted interviews over generous portions of pumpkin, sweet potato and tea with sugar. We listened to the stories of madhebhe players Shorai Katsukunya and Naison Goba as Kuda translated and the three of us asked questions. Today we may go back to Harare and I think I am okay with that. I am recovering from tick bite fever and have minimal energy for another day on the dust roads. First we stop at Kativhu's place and wander in the fields, take photographs among the tomato vines. Should we go to a madhebhe ceremony in UMP? We linger in the shade and mull it over. Hmm, out to Uzumba-Maramba-Pfungwe. It might be far. What kind of ceremony? You'll have to just wait and see. It is at the home of the mbira maker, Masarakufa. Five of us decide to go: Kuda, Kennedy, Charlie, Zack and I. Kennedy and Charlie know all of the shortcuts, but they usually travel by foot. So, we spend the day testing the limits of the truck, first in a muddy field (we had to turn back) and then on the sandy banks of the Nyadire river where a man stole my boiled eggs (the only thing I’ve ever had stolen in Zim, mind you). Hours later we finally commit to the main roads and drive the distance to UMP. It’s late afternoon when we reach the main turnoff - Murehwa to the South and Mutawatawa to the North - where we pick up Kennedy's father-in-law, Chief Usiwako. He directs us to a shrine in order to consult the mediums before proceeding to the ceremony. We spend the whole afternoon and evening there navigating the protocol as it unfolds. Wait here, wait there, remove your shoes, step lightly over the brambles and onto the sandy rocks, sit on the reed mat, clap with us, respond with these words. Play msengu again, play msengu again. Stuck in a muddy field on the way to the ceremony. We spend the night at the shops in Mutawatawa and wake up in negotiation mode to weigh our options. The ceremony was cancelled the night before, but the mediums gave us their blessing to visit Masarakufa today and ask him questions about madhebhe. We know the turn-off from the highway to his place but from that point it’s still a trek to get there. The plan is to meet Masarakufa at the primary school nearest his homestead but his cell phone is off (and likely out of battery for some time now). We can’t reach him and we linger a bit, chew it over, play mbira softly in the background. After bread and tea we get back to the road and head for the turn-off some 30 miles down the road. We drive an hour or more to the primary school and continue along sandy trails and riverbeds. Eventually there is a deep cut in the path that forces us to park and walk. Honestly, I don’t recognize most of the tunes. I know how to play songs of the same name on our mbira, but Masarakufa’s madhebhe is tuned in a different mode and the sound is altogether different to my ear. It makes me wonder how on earth the mediums were able to recognize our versions of “Marume” and “Msengu” yesterday evening. If they are accustomed to Masarakufa’s music, then I would expect the tuning (Kamwaza’s over-tone heavy hera mbira in the standard tuning & mode found in Makuni), the mbira lines (Anthony Zonke’s version of “Marume” and Saini Madera’s “Msengu”) and our lack of identifiable lyrics to throw them for a loop. Their ability to name the tunes with certainty is a testament to the medium’s experience and listening skills, but it also speaks to the crossover between the madhebhe/hera/matepe traditions in general. Sure enough, I try the madhebhe and play "Marume" with relative ease. My fingers know the patterns well, off-set just a bit by the madhebhe layout. Below is a video of Kadori's version of "Ndonda"/"Mauya mauya," recorded by Hugh Tracey in 1933. The two YouTube videos both feature madhebhe players, but the sound is quite different. Let's nerd out about this for just a moment. Thanks to Stefan, Masarakufa's sampled instrument is an option in the drop-down menu for all of the matepe/madhebhe/hera tunes on the sympathetic-resonances.org website. The sampled notes are based on the recording we did that day in Masarakufa's cooking hut, complete with fire crackling in the background that distorts the sound a bit. Take a look at the transcription of Kadori's version of "Ndonda" that Zack meticulously transcribed. Now listen to the playback with Masarakufa's madhebhe (it should be the default setting, so just press "play") and compare it to his live version above. What do you think? Seated on a reed mat in the shade, Masarakufa tells us his story of moving back home from Harare in 1968 because of troubling dreams. This is when he built his first madhebhe (he still plays it today) modeled after one his nephew owned. He discovered at that time that his father and grandfather used to play and they were likely the ones who called him to do the same. He talks about his role as an mbira player for the freedom fighters in the Liberation War (along with several other madhebhe players from Mutoko district). 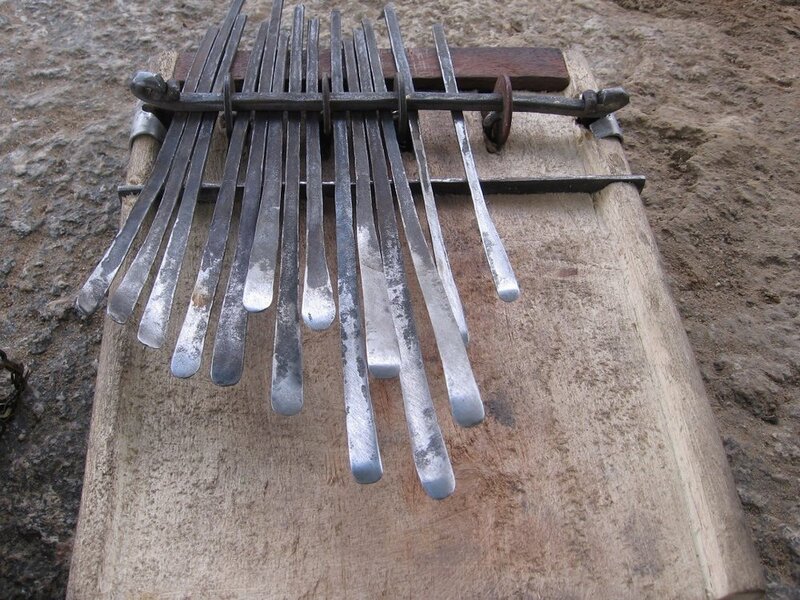 Masarakufa also spells out the importance of mbira directly following the war, when ceremonies were needed to cleanse people from avenging spirits. These days he also walks from his homestead in UMP to Charehwa Village, Mutoko when he is called to play mbira at the Dzimbahwe shrine. Masarakufa tells us about a few other players in the area, but as far as we know he is the only instrument builder in UMP and Mutoko districts. This was our main motivation for the trip, to gain some insight on the construction and tuning of madhebhe in particular. So, Kuda leaves his father’s old madhebhe with Masarakufa in hopes that he can repair the keys. The design of the two instruments are very similar, so we feel confident that this is the right move to return the mbira to a tuned and playable state. Masarakufa shows us the madhebhe he built in 1968. Kuda and I compare his mbira to Partson Nyaruwabvu's madhebhe on the right. Late December, I’m glued to Whatsapp in the AM (evening in Zim) to hear about the latest happenings. I’m surprised when Kuda sends me a mass of photos of a madhebhe that he built. He rode his bicycle all the way back to Masarakufa’s place to pick up his father’s madhebhe. What a bike ride! But, the mbira was still in the works. So, with the same DIY spirit of his father, Kuda collected the instrument and is now building his own. 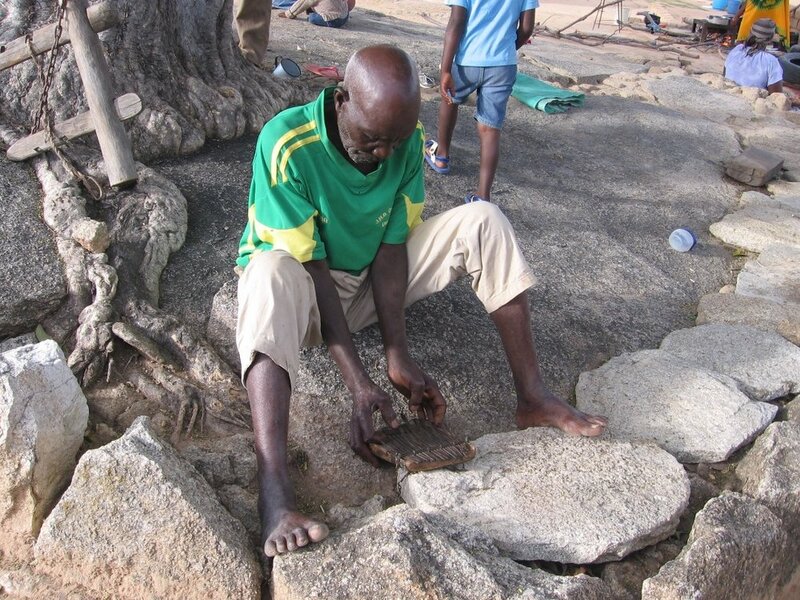 Kuda builds the sound board of a new madhebhe with a mbezo (an adze). The Nyaruwabvu madhebhe (right) next to Kuda's madhebhe in-the-works. Notice the hollow soundboard, metal bridge, and wooden pillow (piro) where the keys will rest. Kuda's madhebhe with half of the keys added. The left index finger keys have the Kamwaza twist in their design. Partson Nyaruwabvu catches up on his playing with the repaired madhebhe. Sign up with your email address and I'll send you a little note when I post something new. I respect your privacy & won't send you spam or share your email address with anyone.